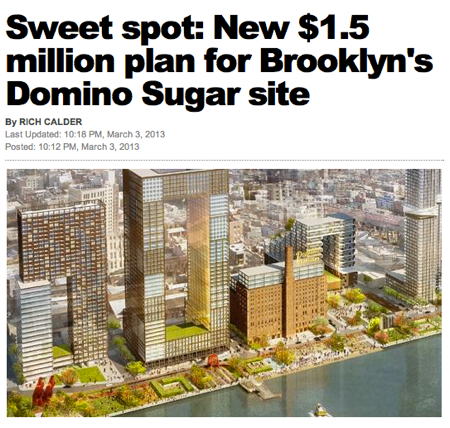 In case you missed it, the new new Domino plans went public late this evening. There is a lot to digest here, including taller buildings, a lot more architecture, more open space, a whole new street, a lot more commercial space, a little less residential space, the same amount of affordable housing. And, according to the Post headline writers, Two Trees has really figured out how to economize on construction costs. Like I said, a lot to digest here. But in the end, it comes down to a question of: is it better?